OTTAWA -- The political aide to Canada's environment minister says the federal government is looking to reduce its use of plastic as it pursues a national strategy to curb Canada's addiction to the material. Two days after Canada and four other G7 nations signed a Canadian-driven plastics charter that commits to keeping plastic out of landfills by 2040, MPs and environment groups are asking what Ottawa will actually do to implement the charter at home. Canada's strategy is still in development, said B.C. MP Jonathan Wilkinson, the parliamentary secretary to Environment Minister Catherine McKenna. "We are looking at the best ways to lead by example, reducing plastic use within government, increasing how much plastic can be recycled or reused, and avoiding purchasing products that come in non-recyclable packaging." 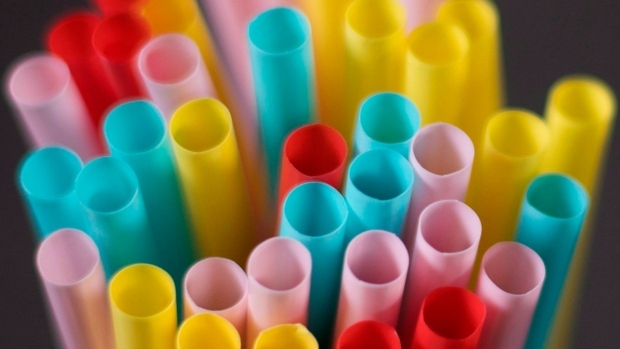 Prime Minister Justin Trudeau has so far stopped short of banning plastics outright, arguing that the problem is much greater than simply getting rid of plastic straws and cups. On Saturday Trudeau got four other countries -- Britain, France, Italy and Germany -- to join Canada and sign on to a G7 plastics charter. While not legally binding, its signatories have agreed to work towards 50 per cent recycled content in all plastic packaging by 2030, and that 55 per cent of all plastics will be recycled, reused or burned for energy that same year. By 2040, all plastic should be "recovered." That last language is most worrisome to environment groups, who say incinerating plastic is not the answer to the world's ocean garbage problem. Ashley Wallis, water program manager at Environmental Defence, said the charter broadly hit the right points, but the vague language remains open to interpretation. "We will still be pushing for Canada in their national strategy not to allow recovery to be an acceptable form of plastic disposal, but there is no reason other countries don't have to go in another direction and just burn all of their plastic," she said. Environmental Defence wants Canada's national strategy to also focus on a producer-pay system, with laws requiring the companies that produce or sell plastic material to be responsible for ensuring it gets recycled or reused. Wallis said while producer-pay legislation would likely be provincial jurisdiction, Ottawa can ensure every province introduces legislation, much as it has done with carbon pricing. Incinerating plastic may keep the products out of landfills and oceans, but it creates emissions and ignores the role played by the production of fossil fuels to keep making new plastics, rather than reusing those that already exist, environment groups argue. Jo-Anne St. Godard, executive director of the Recycling Council of Ontario, said Monday one of the biggest issues in aiming to keep plastic out of landfills is that there is just too much still being produced. St. Godard said a federal purchasing policy to stop buying plastic materials would be hugely helpful because it would automatically create a market for companies to provide alternative products. Wilkinson suggested Monday that such a plan was under consideration, but provided no details on what that meant or when Canada's national strategy would be ready. Canada is playing catch-up with municipal and provincial governments, which are already banning plastic bags, as well as multinational corporations that are eliminating plastic packaging and increasing their use of recycled materials. Last week, Prince Edward Island became the first provincial legislature to pass a law that would ban grocery stores from distributing plastic bags. Montreal banned them in January and Victoria will follow suit in July. Coca-Cola, which produces somewhere around 120 billion bottles a year, has promised by 2030 it will collect and recycle the equivalent to every bottle it makes, IKEA says it won't sell single-use plastics after 2020 and McDonalds and A&W both plan to replace plastic straws with paper ones. Wallis says Canada needs a legally enforceable strategy to make sure companies follow through on their commitments. NDP MP Gord Johns says Ottawa has not yet shown the courage to do the hard work on plastics at home and was not impressed with the charter. "Canadians were expecting an action plan with strategies and clear targets, but, instead, we got a non-binding, vague outline that misses the mark entirely," Johns said Monday during question period.